Interview with Dennis Perrino conducted August 2011. Dennis Perrino and Bob Villalon had known each other in and around the Walsenberg and Gardner area of Colorado for years. Then one day, the two musicians decided to join forces. "This was 1986, when we decided to form a group," said Perrino. "We recruited drummer Jerry Minogue, Bruce Mahan on bass, and Rick Witcowich (Teardrops and Guys and Doll) on keyboards, and I was the lead singer and played guitar, while Bob was on lead guitar." 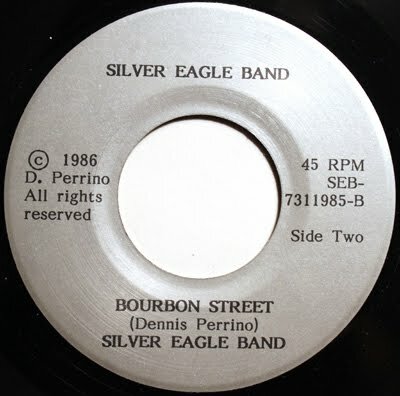 They named themselves the Silver Eagle Band. "The name of the band came about, because one day we were looking at Jerry's drums, and they kinda looked like a silver eagle, all spread out (laughs). The band played most country covers, and a few originals, and once they perfected their act, they started booking gigs. "We traveled all over the United States for about six to seven years, in Wyoming, Nevada, and New Mexico, plus our regular gigs in and around southern Colorado." In 1988, the group decided to record a single. "Robby Hudson was a neighbor of mine. He was a musician, who inspired me to play the guitar," Perrino said. "When I was 13, he was killed in a car accident, and I sang a song he had written, "Colorado Pines and Flowers." When it came time, several years later, to record our first single, I wanted it to be that song." 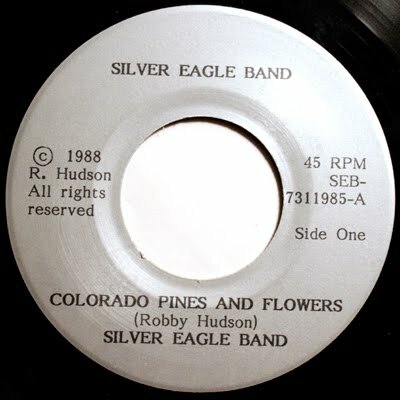 Listen to "Colorado Pines and Flowers"
"The single was recorded at some studio in Colorado Springs. Rick Mouser (sp) did the recording. I think we had about 3000 pressed. We would sell them at our shows." The flipside shows a harder edge of the band. "Yeah, I’ve been accused of being both rock and country," he said. Shortly after the release, the band was selected to compete in the regional Marlboro Country Music Contest. Later they competed in the Colorado True Value Country Music Showdown Finals at the Colorado State Fair. While the band was riding high, opening for Mark Chesnutt, Chris LeDoux, Brooks &amp; Dunn, and Marty Stuart, tragedy would strike when Jerry Minogue died. Then Bruce Mahan left the group. "This left a hole in the band, and we really had trouble finding a replacement - we just kinda lost our interest in the group," he said. By 1995 the band broke-up. "About that time Bob and I went to Nashville," Perrino said. "But after less than a year there, we wanted to come home. " When they returned they decided to try one more time to put the Silver Eagle Band back together. "We picked up drummer Greg Carbjal and guitarist Jim Neveil. Bob moved over to bass." More personnel changes would occur when Jim Neveil left in 1997. Gerald Trujillo took over at lead guitar for the band. They also started incorporating more rock music in their act. Then keyboardist Rick Witcowich passed away, in 2001. The band returned to the studio in 2004 to record The Colorado Sky which was released as a CD. Just when they thought they had a stable line-up, they were dealt another devastating blow with the death of guitarist Gerald Trujillo in November of 2006. After Jerry Minogue died, the group went through a series of drummers, including John Marrella, Greg Carbjal, and Steve Vigil. Eric Valdez subs on guitar. Dennis and Bob have remained the glue which has held together the Silver Eagle Band. In 2011 the group celebrates its 25th anniversary. "We stay very busy, playing The Grove, The Dog Bar, and Shorty's. We're actually booked through September." "This is the first and only band I've ever been in," said Perrino. "Bands come and go, but after everything we've been through, we're still plugging along."